Special Containment Procedures: SCP-719 is to be kept in a secure, lead-lined storage unit at Site-15 when not in use. SCP-719 is to be tested for residual radioactivity on a bi-monthly basis. If residual radiation levels exceed 10 Sv/h when SCP-719 is in an unpowered state, SCP-719-1 is to be removed from SCP-719 and installed into another compatible unit of similar manufacture.1 Once operation of the new unit is confirmed, the new unit will be designated SCP-719 and the old unit disposed of according to site protocols for radioactive waste. 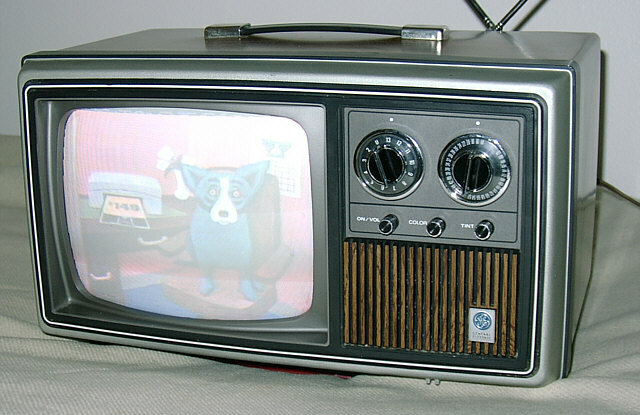 Upon powering on, or after changing a broadcast source, SCP-719 will behave as a normal television set, displaying the broadcast signal it is receiving. However, if SCP-719 is allowed to display any single broadcast source for longer than 13.6 minutes, video and audio will start to diverge from the signal being received. Accompanying this change in the displayed broadcast is a rise in the amount of radiation emitted from SCP-719-1. Should SCP-719 remain powered on, receiving the same uninterrupted broadcast signal, both the divergence in displayed content and radiation emission will steadily increase. The intensity of EM emissions appear to bear no relation to power drawn by SCP-719, and double in strength for each fifteen minutes of continuous operation. Radiation from SCP-719-1 will drop off completely once power to SCP-719 is cut, SCP-719 is turned off, or if the broadcast signal being received is interrupted or changed. Tests have shown no difference in SCP-719’s anomalous properties when changing what channel “broadcast” signals are received, or when changing the origin of those signals.2 So far, any attempts to intercept the altered broadcast signal in order to record it directly have been unsuccessful, and altered broadcasts must be recorded by an external video camera. External scenes will gradually become brighter, night becomes day, clouds vanish, and the sunwhen visiblewill grow progressively larger and whiter. SCP-719 and SCP-719-1 were recovered from the site of an apparent murder-suicide at a ranch outside ███████, Arizona. The ranch had been purchased by a cult calling itself “The Guardians of the Light"4 who reportedly had at least 35 members resident at the compound. On ██/██/19██, agents of the ATF raided the compound based on rumors of a weapons cache. The raid found the bodies of approximately 20 members of the cult in a barn that had been converted into a church. 19 cult members had been shot execution-style while facing the altar. The corpse of the 20th member, apparently the gunman, was found at the altar with third-degree burns on 95% of the body. SCP-719 was on the altar, rear case removed, and one instance of SCP-719-1 clutched in the corpse's hand. The scene was quarantined and news of the incident suppressed by U.S. Intelligence agencies when all bodies were found to show advanced cases of radiation poisoning. The Foundation was called in when U.S. authorities discovered the only radiation source was the case of SCP-719, whose residual radioactivity could not account for the damage to the victims. […] Cannot understand wh […] o to the u […] ot what they beli […] op them before they go an […] ing this, I failed. You have to destroy the […] t's not a window. It's a door.